Kevin joined Argent in 2017 to serve as Market President and to open Argent’s New Orleans office. He will focus on building a presence for Argent in the Greater New Orleans area. Kevin has over 30 years of experience in management, asset management, trust administration, client expansion, and product and service development. 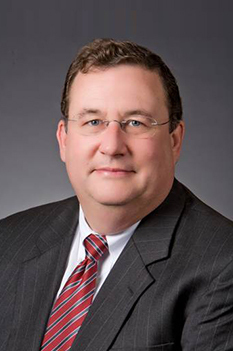 Prior to joining Argent, he served as Executive Vice President, Division Executive of Trust and Wealth Management for Whitney National Bank. He also was Partner of Real Estate Tax Group in New Orleans where he was a consultant for industrial, commercial, multi-family, high-end residential real estate and business personal property assessments, taxes, tax abatement and tax credit programs, and tax-sale investing. Most recently he served as Executive Vice President, Director of Trust, Wealth Management and Institutional Banking for First NBC Bank in New Orleans. Kevin earned a Bachelor of Science degree in business administration from the University of New Orleans. He was past President of the CFA Society Louisiana and Past President of the New Orleans Estate Planning Council. He also frequently offers his expertise as a guest speaker or guest lecturer to many industry peer groups. Kevin and his wife, Michele, have two daughters, Caroline and Elizabeth. His hobbies include fishing, hunting, and target shooting; and volunteering his time with Hogs for the Cause-Swine Krewe, along with other philanthropic and community activities.